Need a bar for your players' home base? A cheesy tiki bar to meet a fence? Or a swanky bistro to court that probably-totally-a-vampire hotty that's tempting your party rogue? This set includes 6 unique pre-made bars; a classic pub, tiki lounge, micro-bar, dive bar, biker bar, and classy "dungeon" bar and nightclub. And all of them include kitchens, back rooms bath rooms and parking lots to get your brawl or sneak on. Or, if nothing quite fits the bill, all the pieces to assemble your own unique watering hole on the fly are included with this set, from booths and barstools, pool tables to packing pallets, to beer, barf, and the mop to tidy the mess, you can create more bars than you can shake a stick at. Compatible with both the Dystpio-Matic and Metro-matic sets. 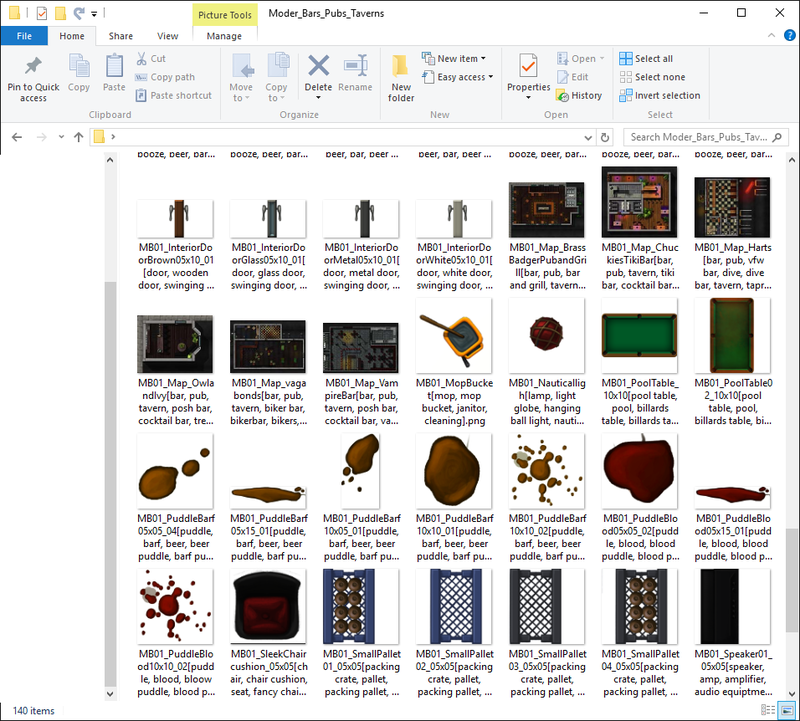 After purchase, you'll get a .zip file with all 139 individual pieces and premade maps, which are yours to mash together in your characters' travels as you see fit. The individual tiles are made to be easily drag-and-dropped together in your preferred graphics software (photoshop, gimp, etc), and then saved out as a single image for the virtual tabletop, or you can upload the contents of the zip to Roll20 and build your dungeons there. Bonus feature for Roll20: The "Your Library" section of the DM tools can be unorganized at times, each filename contains the specific dimensions of each tile needed to maintain seamless integration and reduce headaches. Every file has unique tags built in to their names, so you can use built-in search features to find the right piece for the right spot.